We’ve discussed in previous blogs the importance of ventilation – or more importantly cross-ventilation – and light in your barn. Adequate ventilation can help remove summer heat, moisture, dust and toxic gases. If these are allowed to build up, mold, dampness and disease can result. Plenty of fresh air will provide ventilation and help eliminate respiratory problems with your horse. Openings can add light and keep your horse from being apprehensive when entering a dark barn from bright sunshine. Two additional ways to let in light and promote ventilation are end doors and paddock doors. Typically barn end doors are found on both ends of the barn. They can be sliding or hinged and have a similar width as the aisle-way, typically 12’ minimum. Standard barn door height is 12’, with 10’ height as the minimum. Most often they will be either full wood fill or wood fill in the lower half and glass inserts in the upper half. Some prefer Lexan, a brand of polycarbonate resin thermoplastic that is a common replacement for glass. Lexan is stronger and more durable than glass, yet it provides many of the same benefits as glass. 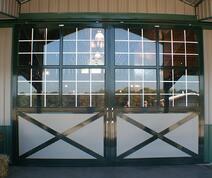 Other options for barn end doors are arched and aluminum. All barn end doors should be made from galvanized steel tubing, most often in 2”, 3”, 4” and 6” framing. Sliding doors should use a track and trolley system. Most have guides that ride in hidden channels beneath the door and then mounted in concrete, though other options are available. For extra large openings, double track systems are often available. For added elegance, consider adding a barn name or logo to your doors. 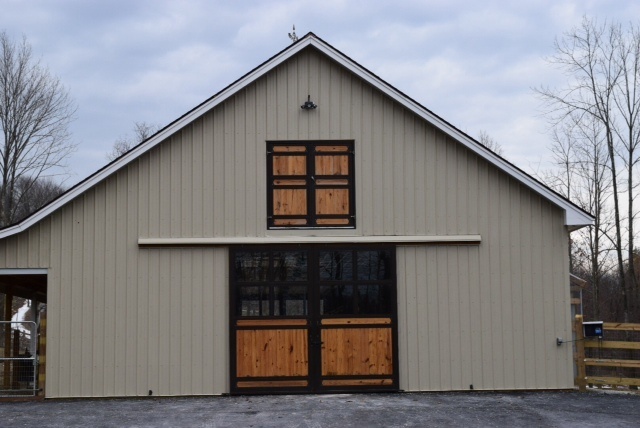 Visit our web site or request a catalog for barn end door ideas. Paddock Doors can also be sliding and can use the same type of track and trolley systems as barn end doors. Look for solidly welded pre-hung metal framed paddock doors for weatherproofing and ease of installation. Standard door sizes are 48” x 88” and 48” x 96”. Paddock doors usually use wood fill and are made to accept standard nominal size lumber or 1” imported hardwood. They can be one piece units or Dutch door style to allow the horse to look outside and increase ventilation. One piece units are typically hinged or mounted on a track and slide open. Hinges should be fully adjustable and both the hinge bolts and compartment latches made of stainless steel for durability and rust resistance. Consider paddock doors that can be open from either the inside or the outside. Our web site and new catalog offer a variety of ideas on how to configure your paddock doors. Sliding paddock-style doors can be used in a variety of other areas in the barn, including feed and tack rooms. If you have a hayloft, consider adding a loft end door. Hinged loft doors should be pre-hung and feature weather tight jams and window options. Hinged loft doors should use an adjustable hinge system and stainless steel hinge bolts and compartment latch. Loft doors can also be sliding and use the same high track and trolley systems as barn end doors. Loft doors can aide in loading hay and supplies as well as serving as another option to bring in fresh air.